Beautiful Magnolia, Cherry, and Flowering Apple trees burst into bloom in April, together with bulbs such as Daffodils, Hyacinths and Tulips, and perennial flowers like Phlox and Virginia Bluebells. Spring is in the air and there is lots to do in the garden! Planting. This is the time to plant trees, shrubs, screening plantings, new flower gardens, ground covers and vines. Wait until May to renovate your existing perennial flower beds so you can see where everything is. In the flower garden, prepare areas for new perennials and annuals by adding peat moss, ‘Garden-Tone’, and dehydrated cow manure, and working-in with a fork or tiller. Cut back old perennials, and mulch with mushroom soil. You can buy ‘hardy’ and ‘half-hardy’ Annuals in the last week of April, but let them ‘harden-off’ for a week before planting. 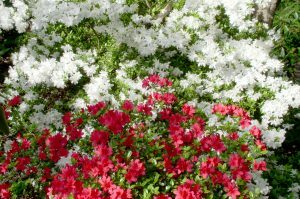 Tender annuals like Impatiens and Fuschia should be planted in mid-May. Dahlias, Cannas and other tender bulbs can normally be planted in late April, as long as they are mulched. It is very important to attend to your Lawns this month. Areas that are thin should be overseeded. Rake the seed in, cover lightly with salt hay, and water. Established areas should be treated in early April with a pre-emergent crabgrass control and fed with a slow release fertilizer. Make a drawing of your Bulbs and where you need to add more, while they are in bloom. This will be useful later! When the leaves of the daffodils turn yellow you can cut them off, it is not necessary to fold and tie the leaves! Vegetables. Plant Lettuce, Spinach, Beets, Chard, Onions, Radish, Peas, Broccoli and Cabbage. Pruning. You should prune Forsythias after they have finished blooming. Most of the other Spring blooming shrubs should be pruned in early June. A list of our services is at the Services page. Call Creative Landscapes at 610-565-9910 for all your Landscaping projects! Happy gardening from the folks at Creative Landscapes!